I don’t think I’ve ever been so happy about a coat!! The weather here has been so horrible recently that I decided I needed a new raincoat, especially if I’m going to venture outside for any length of time. 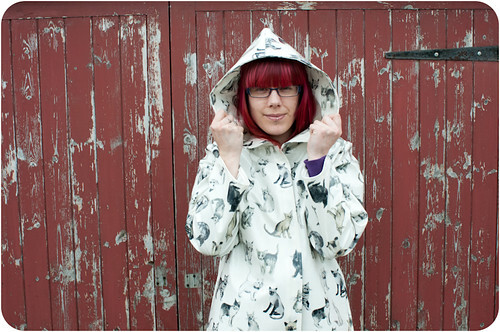 Normal raincoats are boring so of course I had to make one with cats on it 😀 I’m over the moon with how this has turned out. It took most of yesterday afternoon. I will be putting buttons on it but I haven’t been able to find the perfect ones locally so I’m waiting for some to arrive that I bought online. 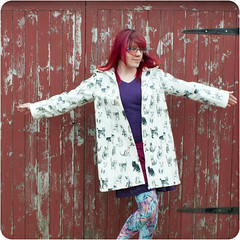 I couldn’t wait to share pictures of the coat though! I love your coat. You look fantastic too. Love this Beth….will you be selling these?? No, I don’t have the time to start sewing lots and it did take ages! Hi Beth! I loved what you did with this coat.I have about as much skill to make a tablecloth but I love this kitty fabric.May I ask where you found it…it’s unique! Well done Girl! 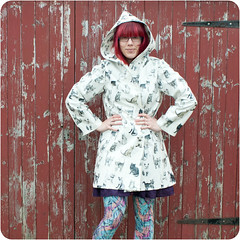 Thanks Beth,everyone loves the coat!Thanks for your reply and hopefully you won’t need the coat all Summer! 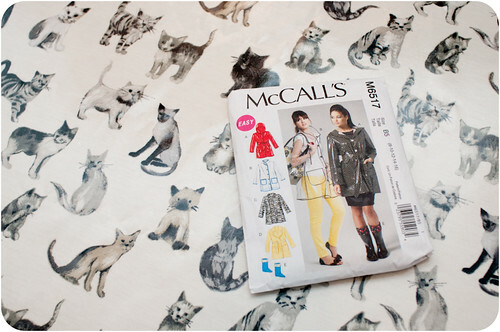 I’ve got the same sewing pattern, and I’ve just ordered my fabric for it. If it turns out half as well as yours I’ll be happy, I’ve gone for green polka dots. I love this coat!!! It looks fantastic! 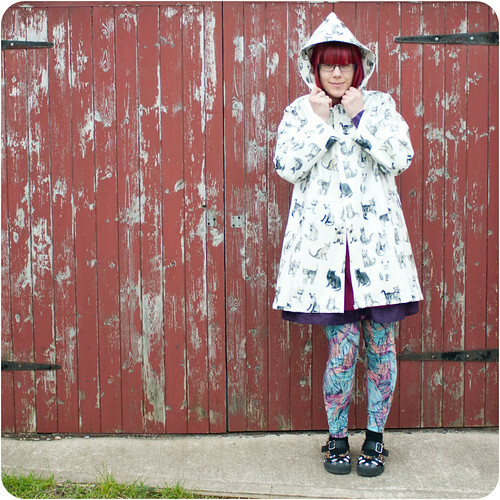 I would love to make something similar to this for the autumn 🙂 How did you find working with the oilcloth – is it difficult for a coat? I’m quite a sewing novice but would love to have a go! Oilcloth is a lot more difficult to sew with, I didn’t enjoy it as much as normal sewing. It’s pretty tricky stuff unfortunately. I have NO idea how I only just stumbled across this, but this is amazing! Think I may have to have a go myself, but I have a few questions for you [if you don’t mind]: how much material did you use? The material I’m looking at is sold in half metre lengths and is 140cm wide, which gives me plenty of material to play with, but I’m not sure how long I need to order for the length [I’m waiting for the pattern to come through, but I’m not entirely sure if that will help]. Also, did you line your coat? If so, with what? I’m thinking fleece for mine, but once again I’m not too sure. Thank you so much for inspiring me! The length of fabric depends on the size of coat you’re making. I don’t have the pattern to hand but it does have all the information on there about how long you need depending on the width of your fabric. I didn’t line mine but I am going to be making a winter version soon with a lining so I’ll post how I get on! ah, Cute Cat Coat love it.